Mix sauce ingredients in a slow cooker. Add pork then spoon sauce over pork just to cover the meat. Place lid on slow cooker and cook on high 3-4 hours or on low 8-10 hours until pork is fork tender. Shred pork in the sauce with two forks. Note: The last time I made this I removed the pork from the crock pot when it was done cooking and shredded it in a separate bowl. I then seasoned it with salt, to taste. I then added in several scoops of the sauce, making sure to catch the onion and chili pieces. I reserved about 1 cup of the sauce, straining out the larger chunks with my spoon. I cooked that sauce on the stove at a simmer for a few minutes, adding a bit of a cornstarch slurry (cornstarch whisked with cold water) to thicken the sauce a bit. This resulted in a less saucy pork with a bit more flavor, and we topped the sandwiches with sauce to taste. I am going to do it this way from now on - even more scrumptious than how I did it before! Serve topped with coleslaw on sandwich roll of your choice (kaiser is always a sure bet). If you're running short on time, Costco sells a pre-cooked smoked pulled pork (sans sauce) that is very good. Just sauté the onions in a large pot over medium heat until soft, add the rest of the sauce ingredients and bring to a simmer. Heat the meat as indicated on the package, then add to the sauce and simmer 10-15 minutes. This is an amazing recipe! I really enjoyed it! oh, I just LOVE hearing that! thank you, abigail! What size can tomato sauce? I finally bought my Costco pulled pork and am eager to try this. Thanks! DELICIOUS! I made this with chicken breast and omitted the green chilis and oregano and cumin (cuz I didn’t have them) and it turned out perfect! A hit with the kids too! Thank you so much! I think your solution could totally work! I would just drain the diced tomatoes a bit, smash them up more and add a paste until it’s the right consistency…and I don’t even think you’ll need extra seasonings because the canned tomato sauce I use when I make this recipe is pretty much just straight up tomato sauce, no seasonings. Hi! I’m excited to try this for my husband’s birthday party tomorrow. Just have a quick question: About how many people will this recipe feed? good question…it makes a lot. I looked up a similar recipe that uses 2 pounds of meat and it says that it feeds 8. this is 2 1/2 pounds, and I feel like we always have a lot of leftovers…I think 10 is probably a good guess. hope that’s helpful!! Can you do this as a freezer meal? Would you just make the sauce then add to uncooked meat and freeze? yes, I think that would totally work! I would just make it to completion then stick it in an airtight container. great idea! Could you use Costco’s pulled pork and put everything in a slow cooker? 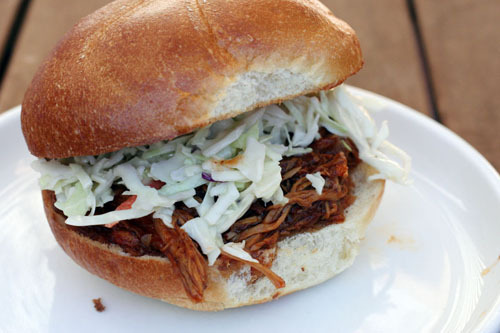 With the Costco pulled pork – how long would you put it in a slow cooker? Thanks! Erin, just until it’s hot! you don’t even need to use the slow cooker if you are using Costco’s pre-cooked pulled pork – you can just mix the sauce ingredients in a large pot on the stove, add the pork, bring to a boil, reduce to a simmer and simmer for, oh, 30 minutes or so. If you did the crock-pot, probably 30-60 minutes on high I’m guessing would be enough. Hope that’s helpful! All these recipies sound delicious but I need to add something besides tomato sauce to the pulled pork (I cannot do heavy tomato sauce – allergies). Any suggestions? What size can of tomatoes does this call for? 8-ounce can of tomato sauce. I will update the recipe now, thank you!